The dovish tone of Federal Reserve (Fed) Chairman Jerome Powell on Wednesday boosted equities and the market reaction to Powell has certainly shown investors are sensitive to statements by the Fed. The recent Federal Open Market Committee (FOMC) minutes released yesterday showed that the Federal Reserve (Fed) considered that another increase in the federal funds rate is likely to be introduced soon, suggesting a rate hike at the upcoming meeting in December. Policymakers also said that monetary policy is not on a pre-set course and can be adjusted according to incoming economic data. Several economists warned against reading the statements as a signal that Fed policymakers, who are still widely expected to deliver their fourth rate increase of 2018 in December and who have introduced three increases in 2019, are set to significantly slow the pace of rate increases. Another perspective indicates that a pause could be in store after the almost certain December hike. The whole world eyes are now currently at the G20 meeting that will take place on November 30 in Buenos Aires, Argentina with a focus on reducing global trade disparities and if those disparities are not reduced, we should prepare ourselves for an escalation of trade barriers that could very well disrupt the global economic recovery. Meanwhile, tensions have escalated between Moscow and Washington over the Russian seizure of three Ukrainian vessels and Donald Trump has cancelled bilateral talks with Vladimir Putin that were due to take place this weekend in Argentina. The initial jobless claims in the US rose by 10K to 234K in the week ending November 24 from the previous week’s unrevised level of 224K and exceeding analysts’ forecast of a drop to 220K. Claims increased for the third straight week, hitting its highest level since the week ending May 19. However, the Thanksgiving Day was observed on Thursday, which could have influenced the data. A larger than expected number indicates weakness in the labour market, which influences the strength and direction of the US economy. Boeing Company (2.72%), Pfizer Inc. (1.36%), Merck & Co. Inc. (0.88%) among the top Dow Jones gainers for the session. Intel Corp. (-2.73%), VISA Inc. Cl A (-1.61%), American Express Co. (-1.40%) were among the worst Dow Jones performers of the session. Since the beginning of 2018 until last Thursday close, the US index is above water with a 2.25% gain and since the start of November, is pushing higher with more than 1.0% rise. Nonetheless, the Dow Jones Industrial Average (DJIA) continues on strong winds in the week with a rise of over 4.5% and on the daily basis closed green with a 0.26% gain. Furthermore, the index made a phase change, shifting from a distribution to a warning phase. On yesterday’s session, the Dow Jones Industrial Average (DJIA) went back and forth without any clear direction, consequently closed in the middle of the daily range, however, managed to close shy above the Wednesday high, which suggests a bullish momentum. The stochastic is showing a strong bullish momentum although is still below the 50 midline. The Dow Jones Industrial Average (DJIA) began November on the right foot but stalled on a key level at 26,185 and turn south toward October low where it has found enough support to push the price back up. 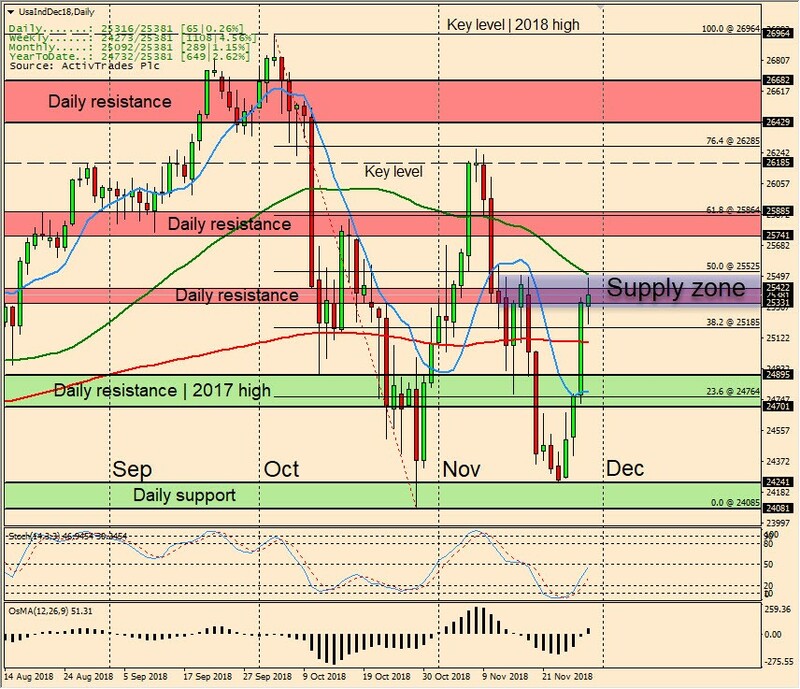 Now the index price is in the confluence of a daily resistance, a supply zone and near the 50-day moving average that should act as a dynamic resistance in which may result at the end of the upward correction and even resume the south direction. UsaInd is a CFD written over Dow Jones Industrial Average futures.